Recent talks about the latest consoles blocking used games has the gaming world talking again. I know this has been discussed in the past on TXL, but has anyone’s views changed? Should the next console prevent used games or should we just let used games die when consoles go digital only (I say this because I see this happening in the future)? I’ve listened to multiple podcasts over the past few weeks and it seems that most people are split down the middle. Most of the gamers on the side of not caring bring up the great point of Steam and iOS games. These outlets already prevent used games. I know they are digital only, but millions of gamers are buying up games from these services. Personally I’m on this side of the fence! I’m not a used game buyer or seller. I spend my money on games that I want to keep. If there is a time that I make a mistake and purchase a game that I do not like I still keep it. I don’t think going to a store like GameStop and getting $5.00 for it is worth it. Some reasons why I think removing used games are the following. Keeping used games around is going to help drive the cost of games higher! We already see this with online passes. Developers want some of the money out of used games so they are adding ways to get your money. 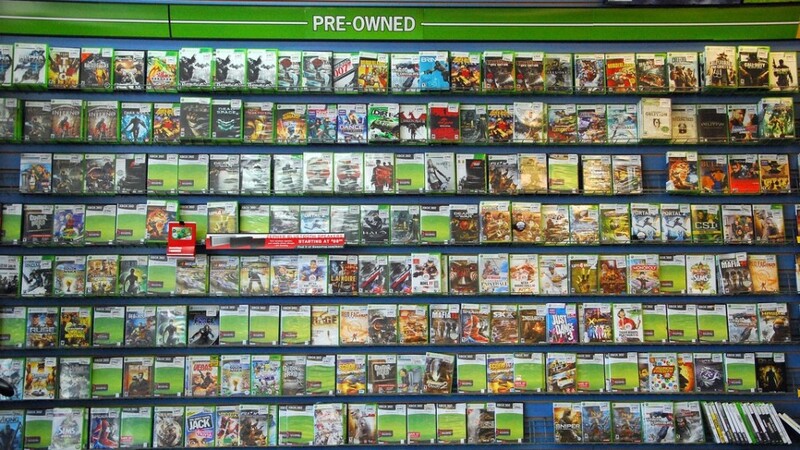 One fact is this…if used games were gone so would online passes. Also if used games were gone games may become cheeper! I think this would have to happen. Again I want to use Steam as an example. Games on Steam have multiple price points and sales. The reason is because the developer always gets a piece of the pie. Ask any PC gamer about Steam. They love it. Now the used game market in the PC world does exit, but I don’t hear as many people protesting it. On the show Wingman709 always brought up a great point of selling what we purchase. I know one big example is used cars. I’ve purchased a used car and even traded in my car to purchase another. Now I agreed with this point until I listened to a recent podcast and found out that the big car companies are in the used car business. The reason why they don’t care as much is because they get a piece of the pie. Now I’m taking this by word, but it makes sense. If this is the case and we want used games to stick around then the publishers/developers would need to get into the used game world, but I really don’t see this happening outside of online passes. What do you think? Am I completely blind to this topic? I know this is a touchy subject for some, but what will it hurt to block them? What will we see in the next cycle if they do not? Will the Steam Box survive if it releases? All things I would like to hear from you about! Hmmmm, so much to think about. You bring up some good points but I do disagree that prices will drop. Why would they? Xbox Live use to cost $50 a year. The bigger it got, the more that people paid for Xbox Live, the higher the price got. And that price went up after having advertisments added to the dashboard. So Publishers and Developers will milk every dime they can. Online passes will go away with digital only or blocking used games. But the Season Pass has now taken place of the Online Pass so they will still be hitting you up for more cash. The bottom line is all about the Publishers bottom line and not the gamers. With a new console, I also predict an increase in game prices to $70 just like they did from Xbox ($50) to Xbox 360 ($60). I also disagree with the Used Car example in a small way. Yes I use it but your answer by saying the Car Companies are in the used market is true, but they don’t make money off every used car sold. So they still lose out on used sales in a big way which is what EA is crying about. They want to make money of EVERY SALE regardless of the situation. Great story and I would love to hear what the community thinks. We will get some info on the PS4 next week and the next Xbox by E3. So we will know more soon. But one thing that might kill this all is the lack of interest by consumers for new high priced consoles. Take a look at the Wii U for example. Its tanking (which we discuss on Episode 229) and I think with the economy the way it is, people are not going to jump on the next big thing as quickly as they did the previous generation. hey guys, I am sure sony and Microsoft have already had private discussions regarding used games. I think when it is time to block them they will do it at the same time. What about gamestop and amazon? couldn’t sony/Microsoft have some sort of agreement with them regarding used games? for example when you sell a game to gamestop you and the publisher gets something for it. and then gamestop could sell that game for $50 instead of $40. I don’t see why the retailer and the consumer gets nothing out of the deal. i think its a win win for everyone. what about redbox and gamefly? they buy thousands of new copys. like you said we will have to wait and see. thanks gamertag brew maister. I rarely buy used games, but it’s nice to pick up something cheap now and then. If used games dissapear, how easy is it going to be to find a new copy of a couple year old game that you never got around to buying and playing? My biggest concern is sharing games. I trade games with my brother once in awhile, not reallyto save money but to play something I otherwise never would have tried. That would take this away from me. It also concerns me for multiple gamers in a single home. It’s already screwed up how an online pass can only be activated on a single account. There’s no reason why kids at christmas who get a copy of madden or nhl can’t play online on their own accounts without having to buy an additional online pass as well. These companies are going to take it as far as they can until they start seeing major declines because people get fed up and move on to other hobbies. Then they’ll back track to somewhere in the middle of the road that makes them as much money as they can get while keeping people buying their games. I’m a big used game buyer, and would be hurt by a lockout, but its already occurring, and it is the future, no doubt. XBLA already and always had full lockdown to your gamertag for all digital downloads. I take my arcade game to my friends house on a USB stick and put it in, he can be player 2 no problem and we can both unlock achievements, but if he loads up single player alone, its the demo version only. As of now there is no way to ‘sell’ a digital copy, and its easy to lock down a physical copy with a code, like windows and office software is. You can’t really vote with your wallet on this, you gotta go with the flow, eventually. I currently buy a lot more games than i can actually play, because they are so cheap used. I imagine this change would stop me from collecting games, but ill still be able to get games ‘used’ in a manner of speaking. Most new games get heavily discounted/GOTY editions at some point when they are older. Ill still be able to get games cheap, just not actually used by anyone. This will make the publishers some minor coin from me, but it will also mean ill buy a lot less games, and only the ones that I happen to catch when they get marked down.